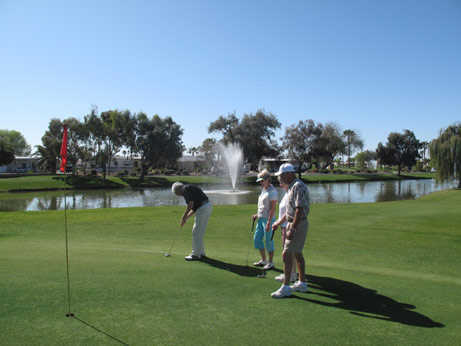 Pueblo El Mirage Golf Course is an 18-hole, championship designed by Fuzzy Zoeller. The layout combines a fair amount of challenges with player-friendly features that make the course accessible to players of all skill levels. 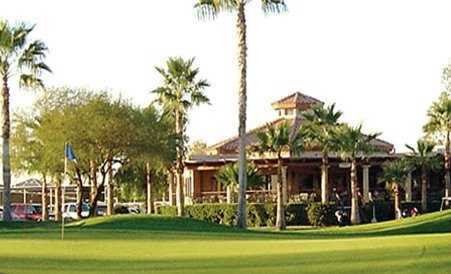 Pueblo El Mirage Golf Course is an 18-hole, championship designed by Fuzzy Zoeller. The layout combines a fair amount of challenges with player-friendly features that make the course accessible to players of all skill levels. The long, rolling fairways and fast greens are tricky but not overly so. There are out-of-bounds stakes along all of the fairways. Sparkling lakes are scattered throughout, coming into play 13 holes. There are also several strategically placed bunkers along the well manicured greens. The third hole is the course's signature. This tricky hole requires a demanding tee shot over water to a peninsular green. There are homes on the golf course but it's hard to notice them with the stunning mountain views that can be enjoyed throughout.